Cristina Dominguez-Eshelman (B.A. ’02) is a foodie, but not the cooking-show-watching, dinner-party-hosting kind of foodie. She’s passionate about food’s role in public health, as well as its impact on social justice issues. That’s right: Access to quality, fresh food isn’t just about reducing diabetes rates or lowering obesity. Dominguez-Eshelman believes it’s also critical for addressing social issues like high dropout rates. 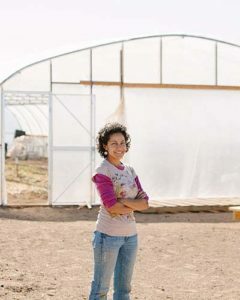 Today, Dominguez-Eshelman is a co-founder of La Semilla Food Center, a nonprofit that encourages healthy, self-reliant and sustainable food systems within the Paso del Norte region of southern New Mexico and West Texas. The project began humbly as a community gardening effort, but it’s grown into something much more. La Semilla – the name is Spanish for seed – works with individuals, children and families to build awareness about food issues and to create alternatives for healthier communities. Dominguez-Eshelman and her two La Semilla co-founders do a lot: They educate students in public schools about food systems, tend to the organization’s on-site farm, organize community outreach programs, and even advocate for policy that helps local farmers. Dominguez-Eshelman’s niche is in the community farm which hosts youth programming, farm apprenticeships, summer camp programs, and public education and workshops. The goal of La Semilla’s farm is to increase access to fresh and locally grown produce for families, to increase access to sustainable agricultural training opportunities, and to demonstrate the viability of small and sustainable agriculture. And targeting young people by connecting lessons taught in school with applied experience on the land is critical. Dominguez-Eshelman’s youth farm program, called Raíces de Tradición y Salud (Roots of Tradition and Health), engages youth in growing perennials and herbs, teaching them about food’s journey from the farm to the table. Together, these efforts serve to inspire a new generation of farmers, food activists and engaged community members in the Paso del Norte region. At its heart, La Semilla is about community. Dominguez-Eshelman sees it as a place where youth and families experience tangible evidence of the impact they can have in their own community while creating a healthy, affordable and culturally significant food source within an arid region. Multigenerational households are common in the region, and food is often the centerpiece of family and traditions. Dominguez-Eshelman sees this network as a valuable opportunity for education. La Semilla hosts family culinary events at which parents and grandparents from many families prepare and cook together. Bringing different generations closer encourages these communities to celebrate food, learn from one another, and develop common understandings about the links between food, health, the environment and the local economy. Cristina Dominguez-Eshelman is a past participant in the internationally recognized Apprenticeship in Ecological Horticulture program at University of California Santa Cruz. She has worked with Heifer International, an organization that fights hunger worldwide, as well as with the Colonias Development Council, a southern New Mexico nonprofit that addresses issues surrounding labor, immigration, housing, education and health. La Semilla installed a filtration and irrigation system to demonstrate renewable energy. They also received a grant from Positive Energy Solar Company to incorporate a photovoltaic solar system at the farm.